At traditional high schools, students experience limited participation in the school’s government. Typical student councils consist of a few students who represent the interests of the entire student body. At Linworth, every student is directly involved in the school government through Town Meeting. Town Meeting has been an integral part of the Linworth community since its founding in 1973. This weekly gathering provides students an opportunity to get involved in their school’s government and decision making process. Students have the ability to propose virtually anything, limited only by school board policy and their creativity. Through Town Meeting, students can change the government style, alter school rules, create fundraisers for the school or other organizations, add art pieces to the building, and clarify and discuss issues concerning the community. The possibilities are infinite. The Town Meeting leader, who voluntarily signs up for the duty, keeps the meeting under control and business moving. Another person takes minutes during the meeting. 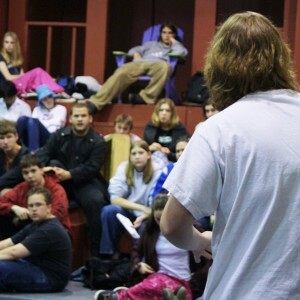 Any student or staff member can present an idea before Town Meeting by writing a proposal. Proposals are publicly posted prior to Town Meeting for people to review. During Town Meeting, each proposal is presented to the community by its author. Sometimes, these proposals can cause a great deal of commotion. In the case of a heated discussion, Town Meeting can be extended or continue past the designated time until business is finished. Legend has it that Town Meetings have gone on for days on those hot issues. At the conclusion of the discussion, the proposal is put to a vote. Each person in the community, including staff, only receives one vote on each issue. The Teacher-Director can veto a proposal or rule adopted by Town Meeting if it isn’t in alignment with school board policy or for some other reason of liability. Besides handling proposals and discussions, Town Meeting offers a variety of other opportunities to the student body. Performances and announcements may be made during the designated Town Meeting time, allowing students to share their creative talents and bring up other issues that may be of interest to the community.